It never fails. When the Hurley Pro shows up at Lowers, so do the waves. Last year, Mick Fanning walked away with the win. The waves weren’t perfect, but there were waves. In fact, they were some of the best waves of the summer. 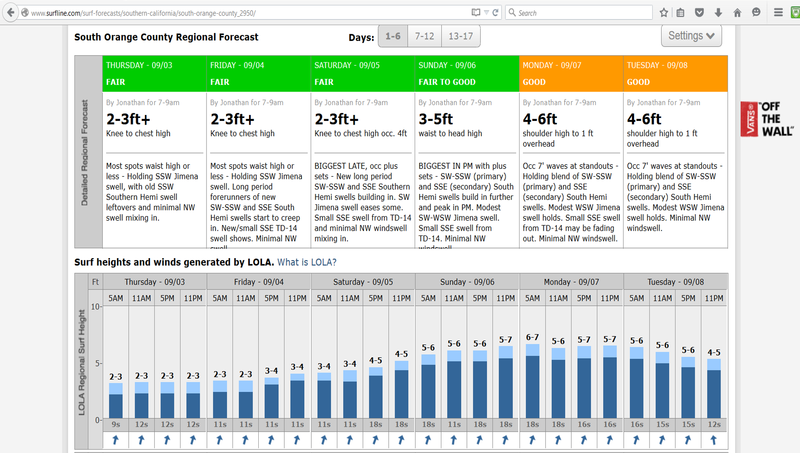 Here is the link to the Surfline forecast for the contest as it appeared on the WSL website last year (2015). This year, the 2016 summer can only be called the “forgettable summer” of waves. But, as it turns out, the waves seem to be on the way for the 2016 Hurley Pro at Trestles and the Swatch Women’s Pro, with a waiting period of September 7 through 18, 2016. Of course! Lowers is expected to be a magnet for fun size waves during the first few days of the waiting period. A sizeable storm in the South Pacific is generating a groundswell while some late cyclones are potentially forming off Mexico. So, get your cameras ready to shoot and collect your favorite keepsake poster for signatures by the pro’s. It’s gonna be another fun celebrity party at Lowers over the next couple weeks as the pro’s roll into town. And, there will be waves. There always are. Because, like the pro’s, the Hurley Pro has a magnetic personality. That’s what we are all hoping for. Since June when we called it in our “June Gloom” post, the Summer of 2015 was not much to talk about. A lot of low energy, small surf with a few single-day, mid-sized tropical swells. The last week has been nothing but chaotic at Trestles. Multi-directional simultaneous fat swells, with heavy south wind most of the day, has at least made for some fun skateboard ramps. The other day at Lowers there were three very distinct swells in the water. Every wave was different from the last. WNW, SSW, SSE. We weren’t complaining because it was head high, but it was just odd. Here is the overview from Surfline’s HurricaneTrak today. 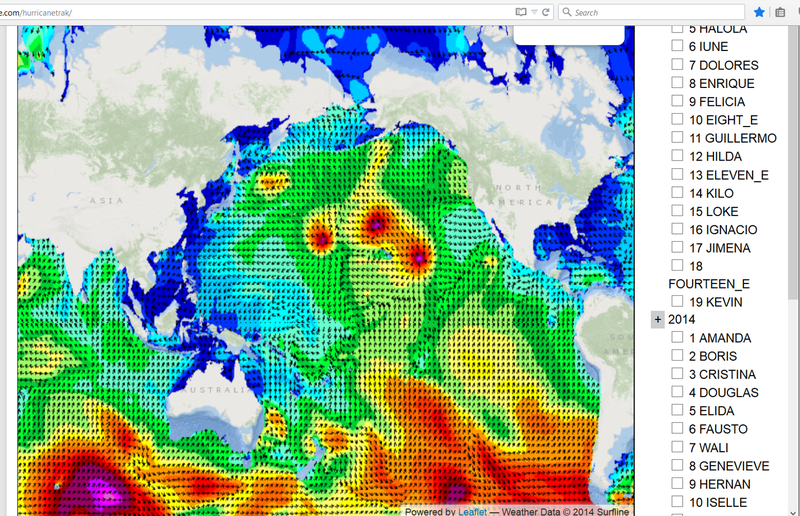 Note the multiple tropical and extra-tropical swells in the northern Pacific, along with a lot of swell activity emanating from the southern Pacific. We are supposed to get a fairly good run of swell over the next week, but it all looks a bit chaotic, to say the least. Superimpose water in the high seventies (F) and it is just a bit odd. One surfer said he surfed 56th Street in Newport on Monday. One minute, the WNW waves were washing from north to south across the groin, the next minute the SSW dropped a bomb of a wall across the entire Echo Bay. The WNW felt like a full-on winter swell, but nobody in the water had a wetsuit on. Odd! Everyone is talking about the “Godzilla El Nino” that is predicted by some forecasters. Surfers are pulling out their “step ups” and watching the buoy’s. Will it be a “Phantom El Nino” instead? Maybe El Nino is already having its effect — chaos, warm water, and unpredictability. Or, maybe that is just the climate change that some say doesn’t exist. Oh, and as always, some fun waves show up just in time for the pro’s as they fly in for the Hurley Pro at Lowers. Unfortunately, it looks like it then flattens out when the competition window opens up from September 9 thru 20. Hopefully, they can get in the water earlier as opposed to later. With that said, the National Weather Service has predicted a busy tropical storm season for the northern Pacific. So, maybe something significant will pop onto the radar in the next couple weeks. Last year, Hurricane Marie created Big Wednesday on August 27, 2014. This year, we are still on the K’s, with Tropical Storm Kevin sending some of the waves next week. It’s not inconceivable for us to roll into the M’s by September 15 or so. Could there be a Hurricane Maria waiting in the wings to provide some drone fodder on our So Cal shorelines for the contest? Laird, how’s the Malibu Pier look from underneath at 20 knots? Got some SUP’s to share with some pro friends? Anyway, make sure you stop by the Hurley Lowers Pro and welcome all those world travelers to the Crowd. Let’s make this a September to Remember.